If you're craving a warm, moist slice of pumpkin cake, studded with chocolate chips, and glazed with rich chocolate doughnut frosting, then you need to make this cake. The recipe is based on a recipe for Pumpkin Chocolate Chip Loaves in Baked: New Frontiers in Baking . It's supposed to make two 9-by-5-by-3-inch loaves, but of course neither of my loaf pans are 9-by-5-by-3 inches. I remembered that the The Art and Soul of Baking had a baking pan volume chart in it, so I flipped to that to see what other pan options I had. I learned that a 9-by-5-by-3-inch loaf pan has an 8-cup capacity. Since the recipe makes two loaves, I needed a 16-cup-capacity alternative. I thought it would be fun to make a bundt cake instead of loaves. I looked up my 10-by-3 1/2-inch bundt pan and found that it has a 12-cup capacity. I had 4 cups more to find and noticed that my mini bundt pans (1 3/4-by-4 inches) each have a 1-cup capacity. With a plan in mind, I buttered and floured my bundt pan and four mini bundt pans. The recipe actually yielded 8 cups of batter. Reasoning that each loaf pan would have held 4 cups of batter, half their capacity, I poured 6 cups of batter in the bundt pan and a 1/2 cup of batter in each of the four mini bundts. It actually worked out perfectly. The chocolate glaze was an after-thought. The finished bundt cake looked rather plain, and I had hoped for something more stunning. While the cake was cooling, I remembered a recipe for chocolate doughnuts with chocolate glaze in The Craft of Baking . I looked up the glaze, saw that I had all the ingredients, whisked everything together, and poured it over the cake. The glazed cake looked far more stunning, and the glaze itself complemented the chips and added even more chocolate flavor -- so I see nothing wrong with that! I hope you enjoy this cake as much as I did! Preheat oven to 350 degrees. Butter and flour pans (bundt pans or loaf pans, as explained above). In a medium bowl, whisk together flour, cinnamon, nutmeg, allspice, ginger, baking soda, and salt. In a large bowl, whisk together pumpkin puree and oil until combined. Add sugar and continue whisking. Mix in eggs, one at a time. Whisk in vanilla and then water. With a rubber spatula, stir in chocolate chips. Fold in dry ingredients. Do not overmix. Divide the batter between the prepared pans (half and half for loaf pans or 6 cups in 12-capacity bundt pan and 1/2 cup in each of four mini bundt pans). For mini bundts, 20 to 25 minutes. Turn after 10 minutes. For bundt cake, 55 to 70 minutes. Turn after 30 minutes. Transfer pans to cooling rack. Let cool enough to handle, and then loosen cakes, and turn them out onto the cooling rack to cool completely. Make the glaze: Whisk together confectioners' sugar, cocoa powder, vanilla, and salt. Whisk in hot water. Add more to thin glaze, if necessary. Pour the glaze over the bundt cake. I had enough for the large bundt cake and one mini. I recommend doubling the glaze if you want to coat all of the cakes. Do you like pumpkin baked goods? What are your favorites? Have you ever done some finagling to get a recipe to fit in a different size pan? You might also like these mini pumpkin whoopie pies and pumpkin chocolate chip cookies with chocolate drizzle. A simple idea to have a monthly breakfast with friends was thrown out casually in conversation at a blogger dinner and soon blossomed into a monthly Boston Blogger Brunch. Renee took the helm, inviting us to vote on a place and setting up a date and time, and soon enough a group of about 12 of us found our way to Lord Hobo in Cambridge, Mass., this past Sunday. We were seated at the large community table in the center of the bar. Perched on bar stools, we scoped out the scenery, mingled with each other, and perused the menu. Some people ordered breakfast cocktails like Bloody Marys, mimosas, and greyhounds. I, a mess with seasonal allergies, went with an iced tea instead. Then menu ranged from fried Duxbury oysters to a breakfast sandwich on a croissant to a mushroom ragu. I was intrigued by the pork belly hash. I ordered it with poached eggs instead of the sunnyside-up eggs typically served with it because I don't really enjoy the hard yolk on the bottom of a sunnyside-up egg and I firmly believe hash should come with poached eggs. I also like to see what restaurants around Boston can actually make a decent poached egg. When the hash and eggs arrived, they came in a cast iron skillet and looked delicious, but a few bites in, I wished the meal had been executed differently. There were large chunks of pork belly and potatoes that needed to be cut up (and I was only armed with a butter knife) and a small pile of finely diced green peppers, corn kernels, and caramelized onions. I wished the pork belly and potatoes had also been diced, so I could mix everything together (like hash) and not have to work so hard to eat my meal. I was also disappointed that my yolks were mostly hard. The peppers, corn, and caramelized onions were so good eaten with a bite of egg. The potatoes, while a hint too spicy (and even the non-wimps at the table pointed out that they were spicy) were cooked well. And the pork belly was, of course, amazing. I gathered that everyone really enjoyed their selections. The first Boston Blogger Brunch was a success, and I'm looking forward to the next one. There's now a Twitter group if you're interested in keeping up with the group or joining in on the next brunch. What is your favorite place for brunch, and what's your favorite thing to order? We went apple picking this weekend! Granted, it was a bit hot for apple picking on Saturday (80+ degrees! ), but we still had a great time and came home with a lot of apples. After a little research and checking around, we decided to go to Smolak Farms in North Andover, Mass. I've heard good and bad things about this farm over the years, but I wanted to go and form my own opinion. Plus, Smolak allows dogs (as long as they're on a leash), so we jumped at the opportunity to take Gunner with us. We piled into the car around 9 a.m. and made the 40-minute drive to the farm, with a quick stop at Starbucks of course. When we arrived, there were already about four rows of cars in the parking lot. 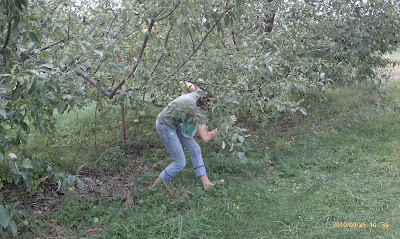 We parked and walked across the street, purchased a large bag ($30 worth of apples), took a map, and got to picking. The apples were organized by type, and the fronts of the rows were marked with the kinds (we also had the map to follow). We both agreed that the back ends of the rows should have been marked too -- it's easy to get disoriented back there. There were McIntosh, Macspur, Red Delicious, Cortland, Macoun, Granny Smith, Mutsu, and Golden Delicious apples to choose from. One of the things I look for in a PYO (pick-your-own) farm is a variety of apples. Nothing disappoints me more than showing up at a farm and only seeing McIntosh -- my least favorite apple. I also needed Granny Smiths for the applesauce for the opposite reason. Granny Smiths maintain their composure, adding nice chunks to homemade applesauce. Other than that, we went on a picking spree. I gathered up lots of Cortlands, my favorites and great apples for baking with, and we picked some Red Delicious and a few Mutsu apples to try. These were described as having a lovely, sweet honeyed flavor. Somehow we managed to fill the bag! We dropped it off at the car and walked over to the store. I got us a couple of bottles of water and some apple cider doughnuts. I keep trying them everywhere, but none are as good as the ones I made a few times last year. ...and set off toward home. We spent a lovely morning on the farm and had a lot of fun together. I recommend heading to Smolak early if you want to pick apples. Roughly 300 cars (ballpark figure and it may even be a bit conservative) pulled in after us. I can understand the complaints that it gets crowded there, but we planned ahead, got our timing right, and missed all of that. You may have seen me mention before that we're in the midst of trying to sell Jeff's condo and searching for a new house together. On Sunday we had our second open house, and I figured it couldn't hurt to have some cinnamon-scented applesauce bubbling away in the slow cooker while potential buyers wandered through. Unfortunately, the fragrance didn't really start permeating until about an hour after the open house ended. But that's okay because we got to enjoy the smell and the warm, sweet applesauce. Combine the vinegar and water in a large bowl. Peel the apples, and cut the flesh away from the core. Place the apple pieces in the water. Once all of the apples are peeled and cored, cut the apple pieces into 1- to 2-inch chunks and place them in the slow cooker. Stir in 2 tablespoons of sugar and 1/8 teaspoon ground cinnamon. Remove lid, and stir the apples. They will melt into a thick, creamy sauce. Add the additional sugar and cinnamon to taste. The applesauce can be eaten warm (recommended!) or cold and will last up to 5 days stored in the refrigerator. What are your favorite things to make with apples? Where do you like to go apple picking? Jeff made me promise to make apple cider doughnuts if we went apple picking, so those will be coming soon, I hope. Hi guys! First, I wanted to let you know that CSN Stores, where you can find everything from a platform bed to wall art, has offered to let me review a product. I'm placing my order soon, and I'm looking forward to telling you about what I choose. Now, onto the soup! It is a huge goal of mine to do a lot of soup making and bread baking this fall. I can proudly announce I now have one soup under my belt. While flipping through The New Book of Soups , I came across a simple zucchini soup recipe that I had somehow missed during my other flip-throughs. I like when that happens. I often turn to my cookbooks looking for something specific, but it's when I have no particular dish in mind that I stumble upon some of the best stuff. This soup combines lingering summer produce with smoky bacon. The bacon is sauteed first, and while I love the flavor it imparts, next time I make this soup, I'll probably scoop it out of the pan and save it to toss on top. I'd just flavor the soup with the fat instead and leave myself crispy bacon to toss on top rather than have soft bits of bacon in the broth. Besides that, I wouldn't change a thing! I made the soup one afternoon and served it with cheddar rusks -- slices of baguette, toasted, topped with cheddar, and popped under the broiler. The soup lasted me all week for lunch at work, along with a Bagel Thin or a piece of toast in place of the cheddar rusks. (I could only dream of having a broiler at work. We don't even have a toaster oven.) Some grated Parmesan sprinkled on top almost makes up for the lack of broiled cheddar. Saute the bacon in a soup pot over medium heat until crisp, 5 to 7 minutes. Add the onions and garlic, and cook, stirring frequently, until onions start to brown, 8 to 10 minutes. Add the zucchini, cover, and cook until translucent, about 5 to 7 minutes. Add chicken broth, tomatoes, tomato puree, and sherry vinegar. Bring to a simmer and cook for about 15 to 20 minutes, until veggies are tender and flavor has developed. Add the basil and season to taste with salt and pepper. Serve with cheddar rusks or your favorite bread or toast. Even crackers would be nice. What's your favorite kind of soup? I love hearty soups, chock-full of veggies, like minestrone. Oh, and that adorable Le Creuset mini cocotte is part of a set of four, comes with a mini cocotte cookbook, and was a birthday present from Jeff. You might also like this lentil soup.